Elon Musk's space company is now ready to test its biggest rocket to date. Watch the Falcon Heavy rocket launch live here later today! 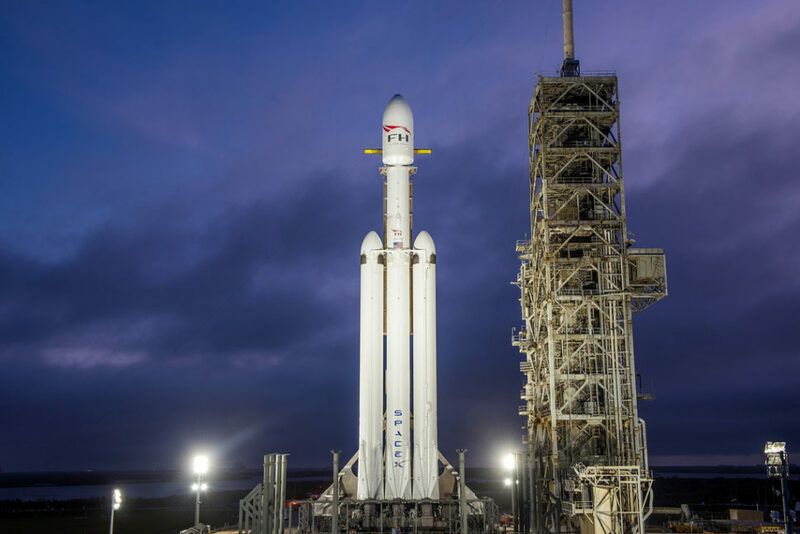 SpaceX is all set to launch Falcon Heavy, the company’s biggest rocket to date. After months of anticipation, Elon Musk‘s space company is now ready to test its biggest rocket to date. The 230-foot tall Falcon Heavy is equipped with three rocket boosters that will launch it into space. If the test launch is successful, SpaceX‘s launcher will become the most powerful rocket in the world. It is scheduled to blast off today between 1:30 and 4:30 P.M. Eastern Time at the Kennedy Space Center in Florida. Today’s test launch was initially planned by Musk to happen back in 2013. Obviously, things didn’t go as planned with the highly anticipated launch only happening today, five years later. The rocket was reportedly tested last January but Musk added that it’s highly possible for their efforts to fail and the launcher to explode. “Just bear in mind that there is a good chance this monster rocket blows up,” Musk told astronomer and writer Phil Plait in an interview back in December. Essentially, the Falcon Heavy is just three Falcon 9 launchers strapped together. However, the rocket has undergone a series of specific alterations to meet the required three-booster specification. That includes strengthening its core booster. At the base of the rocket, there are 27 Merlin engines capable of producing nearly 23,000 kilonewtons of thrust. Reports claim the power of this rocket to be slightly more than double that of Delta IV Heavy, currently the world’s most powerful rocket owned and operated by SpaceX’s rival, the United Launch Alliance. Usually, test launches require dummy payloads or standard mass simulators to be loaded to the rockets. However, Musk thought that to be quite “boring.” Instead, the tech billionaire decided that he will put his personal 2008 midnight-cherry-red Tesla Roadster on top of the monster rocket. “SPACE EXPLORATION TECHNOLOGIES Is authorized, subject to the provisions of 51 USC Subtitle V, ch. 509, and the orders, rules, and regulations issued under it, to conduct a launch. 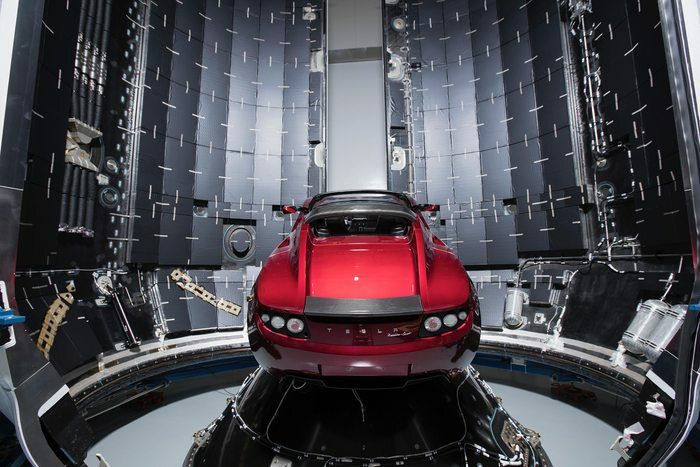 The Roadster will be sent out as far as the orbit of Mars through a path known as the Hohmann transfer orbit, or hyperbolic orbit as mentioned in the FAA permit. However, the roadster will carry no risk of actually landing (intentionally or otherwise) on the Red Planet in order to avoid any form of bacterial or biological contamination. According to experts, the Hohmann transfer orbit could determine Musk’s future plans for his rocket and what its flight would mean for the aerospace industry. If the Falcon Heavy doesn’t explode, it will forever be etched in the history of space exploration. If successful, SpaceX will continue with launches for its paying customers later this year, which will only cost around $90 million per launch. This is roughly a third of the cost of the company’s competitor rockets. The significantly affordable price offered by SpaceX is said to be due to the launcher’s reusable boosters. After launching the payload into space, the two side boosters will land simultaneously back to the Kennedy Space Center while the core booster will land on SpaceX’s “Of Course I Still Love You” droneship in the Atlantic. Do you believe the Elon Musk’s Falcon Heavy will survive this test launch? What about the Tesla Roadster? Do you think it’s going to reach the orbit of Mars as Musk hopes? A leap forward for humanity! This is one for the history books!